Listen to podcasts in a greatly improved Pocket Casts, make your internet faster and more secure and more with the best Android and iOS apps this week. The excellent podcast app Pocket Casts has been given a major update to version 7 for years. A load of new functions feels logical and never overwhelming due to a renewed design. 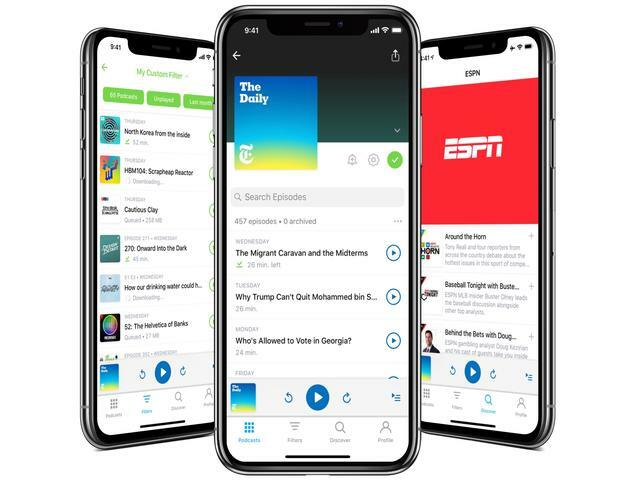 It starts with a clear tab bar, which provides access to podcasts you subscribe to, filters to organize those podcasts more easily into playlists, a discover screen and your profile. The playback screen is clearer than ever, and shows all the information without having to browse. Among the big buttons for play / pause and rewind, the keys include AirPlay and Google Cast, a sleep timer, and settings for playback speed with fine voice boost and automatic clipping of silences in podcasts. Scroll down on that playback screen for a possible list of chapters, including the following podcasts on the playlist. This list can easily be reordered by dragging episodes. Add is also simple: swipe left over an episode from the Podcasts tab, and you can add the episode above or below your current playlist. The large consumer of podcasts can easily create automatic playlists in the Filters tab, based on all kinds of filters such as appearance date and playback status. Finding certain episodes is now easier with an extensive search function, and episodes are now being synchronized between devices. That way you can easily listen through the Pocket Casts site or desktop apps for example. The app also has a new black theme, which looks especially on telephones with OLED screen. The iOS version of Pocket Casts 7 is off, the Android version is in open beta where existing users can participate for free. This app from the American internet company Cloudflare is a so-called DNS service. The app makes the internet a bit faster, and especially safer on public networks. That actually works simple: DNS stands for Domain Name System, and works as a sort of telephone book with which your internet provider searches which server belongs to the internet address that you have typed. 1.1.1.1 takes over that task, and searches which number belongs to which address. On average, the service is 28 percent faster than other DNS services, according to DNSPerf measurements. That is noticeable, but frankly especially with slower internet connections. However, the average Dutch connection, fixed and mobile, is so fast that the difference is negligible. However, the service also promises to be more privacy-friendly than the average DNS service. 1.1.1.1 encrypts your DNS requests, and does not track which sites you visit. That promise is controlled by the KPMG company. Internet service providers legally have to keep such logs, and some other DNS services sell such data for advertising purposes. This makes 1.1.1.1 faster and most likely more privacy-friendly than the DNS service that your provider offers by default. Whether you prefer to entrust that task to Cloudflare remains a personal preference. The app is in any case very simple to use. Note that a DNS service is different from a VPN service. Those who want to completely shield their Internet traffic opt for a VPN, often against payment. In contrast, this DNS service is free. One of the most versatile photo editing apps for iOS. Darkroom has been featured in this list before, but has since expanded considerably. This is how Darkroom works seamlessly with the Halide photo app. With those apps you make photos in RAW, with Darkroom you adjust those images. New features include the option to easily switch between photos taken in RAW to the same photo in jpeg. This is handy, because sometimes the iOS automatically edited JPEG provides a better picture, while you have to work manually with a RAW photo at other times. You can also adjust the depth of depth of portrait photos with Darkroom, a function that is normally reserved for the latest iPhones. When exporting photos, it is now possible to export multiple photos with the same settings, such as with the same GPS information and copyright. You can also export multiple photos at once and apply the same editing options to all those photos. Handy for Instagram: you can save your favorite series of hashtags in Darkroom. If you then export a photo to Instagram, those hashtags are automatically pasted. Darkroom offers very powerful and expanding editing options, and is updated frequently to make use of opportunities from both new iPhones and colleagues' apps.